Do you have old wetsuits, dilapidated thongs or worn-down wettie mats hanging around your house? Not sure what to do with them? Well here's an idea, how about upcycling or recycling them? 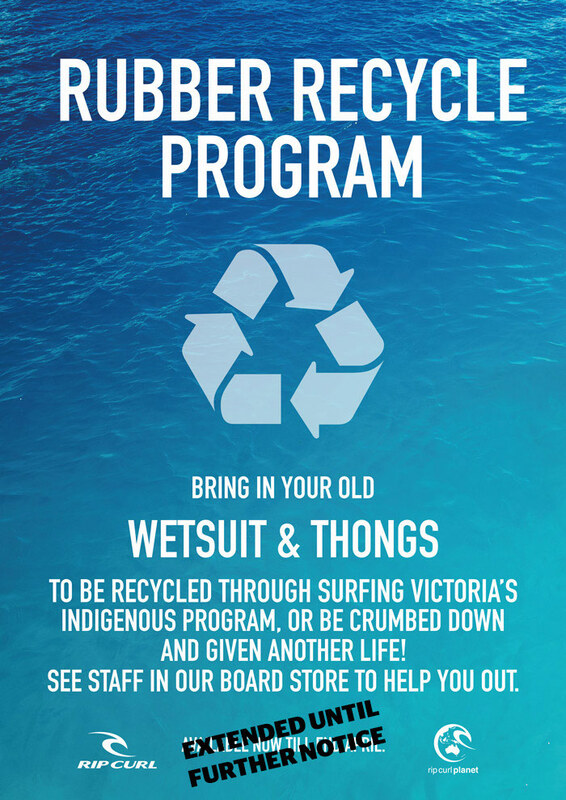 For the last few months Rip Curl has been trialing a Wetsuit Recycling Program at their Torquay Store and they are continuing the recycling program for the rest of the year due to its success. The rubber being brought in are either upcycled through Surfing Victoria’s Indigenous Program, or the remaining suits that are not suitable will be crushed up and recycled into rubber flooring, playground mats and other rubber things. So get to rummaging around your house, find that old rubber and head in to the Rip Curl Torquay Boardstore. Where a staff attendant will take the rubber off your hands. So far over 20 wetsuits have been donated to the Victorian Indigenous Surfing Program. Which will help keep young Indigenous kids warm and will allow them to surf more this coming winter. What's even more exciting is that in the future this program could potentially be carried out in Rip Curl stores around the world.